- KUL passengers movement increased 5% to 27,529,355 in 2008. 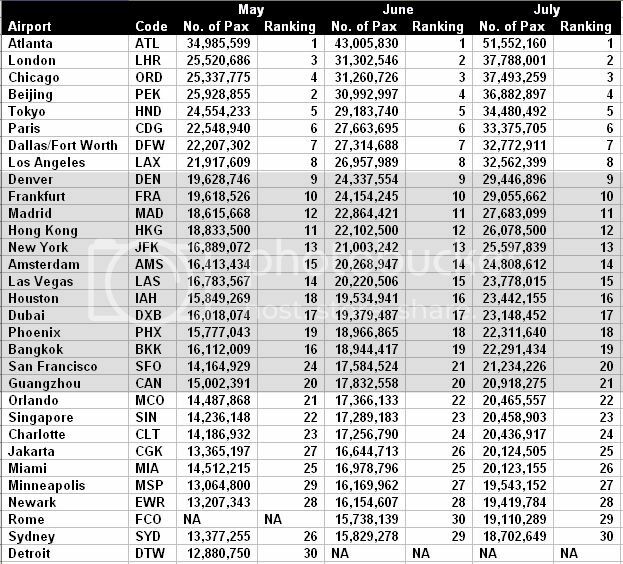 Airports Council International has yet to release their annual ranking, so I am not sure about KUL's placing in the global level. International passengers handled was 17,836,667 while the remaining was domestic passengers. If KUL can maintain the growth, we can expect the number of passengers to hit 29 million in 2009. *JHB could be in the list, but since the airport is privately managed, the information is not available for comparison. - KCH surpassed PEN as Malaysia's 3rd busiest airport in 2001, but in 2008, PEN has managed to clinch back the spot. - IPH handled 100% international passengers in 2008. No domestic passengers whatsoever. 1. IPH - 5,376 (up 560.4%) Kartika Airlines' sole contibution. 2. SZB - 307,747 (up 222.0%) Definitely contributed by FY's blossoming business. - Airport with the worst growth is Melaka (down 12.7% to 23,751 passengers) but the number is expected to increase this year, following the recent completion of the airport's upgrade. Out of the number only 38 were domestic passengers, the rest were international passengers. Without this 38 passengers, Melaka is another airport in the country that handled 100% international passengers. - TGG handled 3,897 international passengers movement, which I think reflecting the inaugural Hajj operation in that airport last year. Some more notes to share. These 3 destinations were also the only one with more than 1 million passengers movement. 1. Vientiane - 35,882 (up 935%) Congratulation to AK for being the only reputable airline operating into the Laos' capital. 2. Banda Acheh - 54,232 (up 765.6%) AK and FY operated flights into Banda Acheh from KUL and PEN respectively. 3. Krabi - 61,017 (up 372.6%) Again, AK's contribution. 4. Pekan Baru - 34,415 (up 121.1%) QZ's contribution. - The worst growth is for passengers' movement to/from Cebu - 10,333 passengers (down 37.2%). This is contributed by MH's downsized operation in CEB (only 2 weekly flights from KUL via BKI). - 3 destinations made its debut. Passengers' movement to/from Manado, Ujung Padang (Makassar) and Yogyakarta were recorded for the first time. AK started service into the first 2 destinations while MH commenced JOG, all in 2008. - 5,230 passengers movement from Utapao is recorded too, which I think representing the movement of passengers during the closure of Suvarnabhumi International by street protester last year. KUL was one of the airports that provide relief flights bringing out stranded travelers in Thailand during the unfortunate event. These 3 destinations were also the only one with more than 350,000 passengers' movement. 1. Hangzhou - 101,948 (up 7,694.2%) D7's contribution. 2. Haikou - 58,330 (up 1,051.2%) AK's contribution. 3. Nanning - 12,975 (up 333.5%) Shenzen Airline's contribution. - The worst growth is for passengers movement to/from Nagoya - 1,127 passengers (down 97.6%), which is contributed mostly by MH's termination of their NGO service. Melbourne overtook Sydney for the first time. 1. Gold Coast - 102,936 (up 585.6%) D7's contribution. 2. Christmas Island - 3,651 (up 151.1%) Probably contributed by more charter flights by MH? - The worst growth is for passengers' movement to/from Brisbane - 90,448 passengers (down 17.8%). As we all know, BNE is now being tagged along with SYD in a triangular service, KUL-SYD-BNE-KUL, which makes the flight unattractive to frequent travelers, especially on the outbound flight since one has to transit in SYD. - 1,481 passengers movement from Port Moresby is recorded for the first time too, which representing Air Niugini's 1 weekly service into KUL. These 3 destinations were also the only one with more than 200,000 passengers' movement. However, I have no idea that there is a schedule flights to and from both destinations. Are these from charter flights? - The worst growth is for passengers' movement to/from Dhaka - 330,962 passengers (down 19.2%), which rather surprised me because I thought the number should increase since the number of airlines that serve DAC increased. Probably the government has slowly acquiring labours from Bangladesh? - 9,585 passengers movement from Thiruchirappali is recorded for the first time too, representing AK's service into the city. There is only 1 destination from this region, which is Tashkent, which recorded 30,378 passengers movement, an increase of 17.6% from 2007. Now this is an interesting case. I read mostly negative comments when the topic about Uzbekistan Airways' 2 weekly services into KUL is being discussed. There are 15,940 passengers' arrivals and 14,438 passengers' departure from/to Tashkent recorded in 2008. Uzbekistan Airways operated 2 weekly flights into KUL. This translates into (52 weeks x 2 weekly flights = 104 flights into KUL in 2008). For arriving: 15,940 passengers/104 flights = 154 passengers carried in each Uzbekistan Airways' flight into KUL. If the airline used its Boeing 757-200 (26J/158Y seats) into KUL, it translated into 154/184 = 83.7% load factor in each flight throughout the year, which is quite outstanding in my opinion. For departure: 14,438 passengers/104 flights = 139 passengers carried in each Uzbekistan Airways' flight back to Tashkent. Again, if the airline used its Boeing 757-200 from KUL, it translated into 139/184 = 75.6% load factor in each flight throughout the year. So I guess, Uzbekistan Airways is doing quite well in KUL. These 3 destinations were also the only one with more than 165,000 passengers' movement. 1. Dammam - 11,517 (up 194.7%) Probably SV's contribution. 2. Cairo - 38,690 (up 121.4%) MS' contribution. - The worst growth is for passengers' movement to/from Beirut - 20,986 passengers (down 16%). Overall decline of passengers' movement from this region is not significant. These 3 destinations were also the only one with more than 140,000 passengers' movement. - ONLY Amsterdam recorded a growth of passengers' movement. The rest were negative growth. - The worst growth is for passengers' movement to/from Vienna and Zurich (both down almost 100%). This is contributed by MH and Austrian Airlines' termination of their services into the cities. Among the cities that MH still serves up until today, Istanbul recorded the worst growth, 19,615 (down 39.5%). These 3 destinations were also the only one with more than 28,000 passengers' movement. - ALL destinations recorded a negative growth, EXCEPT Mauritius, which saw a passenger's movement of 27,478 (up 9.5%). All destinations are served by MH, except Mauritius, which is being served by Air Mauritius. - The worst growth is for passengers' movement to/from Los Angeles (down 29.8%). Edited by Mohd Azizul Ramli, 16 May 2009 - 12:02 AM. - MH market shares for international segment in KUL down 7%. The airline losing 871,604 passengers in 2008 from 2007. But MH is still the largest airline in KUL, controlling 38.4% of the pie (from 45.4% in 2007). Worrying, isn't it? - Balancing the scale, AK's market shares rose 4.8%. The leading LCC recorded a growth of 1,012,055 passengers in 2008 from 2007. - Indonesia AirAsia recorded a growth of 409,250 passengers. - KLM gain 23,416 passengers. - Emirates gain 10,679 passengers. - AirAsia X made its debut in the top 10 with 256,936 passengers' movement. - Qatar Airways also made its debut in the top 10 with 246,273 passengers' movement. - SQ's market share down 1.3%, losing 104,070 passengers. - CX lost 28,096 passengers. - TG lost 116,262 passengers. 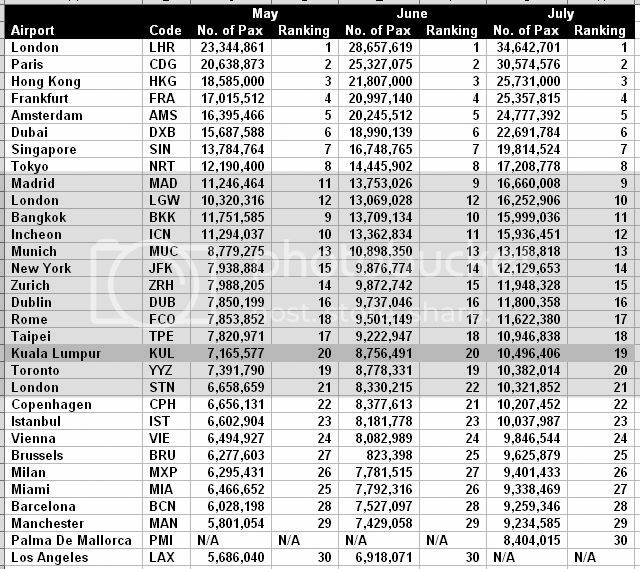 - China Airlines and Japan Airlines are no longer in the top 10 list of the largest international airlines in KUL. Edited by Mohd Azizul Ramli, 19 May 2009 - 11:37 PM. The negative growth of MAS could be contributed by the implementation of successive BTPs. So it is by design, no? Thanks Azizul...very interesting read! i suspect the one million lost by MH have moved to AK! Yup, thanks Azizul. To be honest, I didn't know, or knew but disregard, that JHB is not managed by MAHB. Evidently, annual reports on ops stats are not really my forte.. Are big jumps in percentages normal in airports ops stats? Edited by Irni Mastura, 21 May 2009 - 02:26 AM. It's 1% actually. I forgot to move my pointer of .00 to the right. I suspect the one million lost by MH have moved to AK! I suspect the same too. Based on the example that you quoted, it was 2,694 passengers in 2008 against 4 passengers in 2007. So it is possible for such extra ordinary percentage to occur. However, this kind of number usually appears in irregular services. I believe the flight from Chittagong and Peshawar which posted high passengers' movement percentage are probably a one off event. MH BTP may have successfully cut down operational cost but believed have reduced even more pax. It is interesting to see to how low this number will fall, until it starts to stagnant. Then we can actually see the actual market (in terms of number of passengers) for MH in this very competitive era. Speaking of downward market shares, perhaps the BIGGEST and most enlightening information that I found from the statistics is about MH's massive decline in the domestic market shares at KUL, the main hub of the 2 carriers. In 2007, MH's market share fall 6.1% from 2006 but the flag carrier still control the majority of the domestic market by a slim margin of 261,429 passengers. However, the airline recorded an even higher downfall in 2008, falling 7.2% more when compared to the same 2007. AK flown 5,050,841 domestic passengers in 2008, overtaking MH for the first time ever in the history. AK control 54% of Malaysia's domestic market in KUL at the end of 2008. The self proclaimed 5 star carrier only managed to deal a business with 4,356,773 domestic passengers. The margin between the 2 national carriers in 2008 is 694,068 passengers, favouring AK. In comparison, MH carried less passengers in 2008 than AK did in 2007, it's that bad. This is a BIG news to me. It reminds me of the day when Perodua overtook Proton as Malaysia largest car manufacturer/seller. AK is definitely in an extremely strong position to eat MH out even more in the future, in domestic market (which they already did) and the international market (probably in a couple of years). Edited by Mohd Azizul Ramli, 25 May 2009 - 03:48 AM. KUALA LUMPUR, July 3 (Bernama) -- Malaysia Airports Holdings Bhd (MAHB) is looking at the prospect of further incentives for airport charges, says chairman Tan Sri Dr Aris Othman. Aris said MAHB submitted the proposal to the government earlier this year and is waiting for an announcement. "We are looking at rebates and benefits for airlines based on passenger growth," he told reporters after the graduation of 178 airport fire and rescue services staff. Aris said there are already incentives to attract airlines, adding that "foreign airlines enjoy free landing and parking for three years since 2002. "In April this year, we introduced 50 per cent discount for landing charges until 2011 for all airlines," he said. "Our airport charges are the lowest in the region," he said. He said MAHB also monitored incentives by regional airports to remain competitive. Of the 39 airports managed and operated by MAHB, Aris said nine of them are profitable including five international airports -- KL International Airport (KLIA), Penang, Langkawi, Kuching and Kota Kinabalu. As to the impact of H1N1 virus, he said for the period between January and June this year, passengers at KLIA recorded a 16 per cent drop in passenger volume while the low cost carrier terminal registered 29 per cent increase. Just to share a recent statistic from a news article first posted by flee in another thread, that further proved that MH is losing so much market shares in KUL and that AK/D7 are getting stronger more than ever and all set to become the largest airline operating in KUL for both domestic and international segments. Kindly noted that both our neighbours at the north and south are world's top 20 airport, and DXB is just having a phenomenal growth thanks to its world's conquering flag carrier. Just enviable! So where does KUL placed in 2008 on world's stage? KUL was the world's 27th busiest airport in terms of cargo handling (in tonne). As a comparison, in 2007, KUL was unplaced in the top 30. SIN is world's 10th busiest, while BKK is world's 20th busiest. Both our neighbours handled more than 1 million tonnage of cargo, as opposed to some 600,000-ish handled by KUL. Nevertheless, good comeback and hopefully we can keep up the growth. And that's it. Our airport is too small to make it into the aircraft's movement ranking. How is it going for 2009 so far? According to the data collected up until 14 August 2009, from January to May 2009, these are the world's busiest airport in terms of passengers traffic. All leading airports recorded a decline in passengers traffic in line with the unfavourable economic climate (I think SIN's numbers are quite devastating), with the exeption of DXB (of course! ), CAN and a surprised entrant, CGK (yes, that's Jakarta's Soekarno Hatta!). Now that's made 3 of our neighbours ahead of us. KUL's data are not available as our airport failed to make it into the top 30 list. As for cargo handling, from January to May 2009, KUL recorded a decline of 26.6% but still in top 30 list (at number 29). Interesting to note that only 1 airport recorded a growth, CAN at the time even DXB experienced a decline of 0.4%. Despite the double digit decline in cargo movement, KUL recorded a much better number for the international passengers traffic. From January to May 2009, KUL handled 7,165,577 of international passengers, a decline of only 0.8% from the corresponding period in 2008, which made our airport ranked as 20th busiest in the world, in this sub-category. I doubt the relevant parties are going to listen to us enthusiast-airmchair CEO wannabe-keyboard warrior etc LOL! KUL is still no where in the top 30 list. 3 of our neighbours as highlighted in purple; BKK, SIN and CGK are still ahead of us with CGK is experiencing a growth year on year! Those highlighted in blue; PEK, DXB and CAN (including CGK too) are airports that manage to defy the trend of negative growth due to the current economic climate. Again, neighbouring airports are highlighted in purple and the sole airport which recorded a growth is highlighted in blue. Does anyone know why Guangzhou (CAN) is performing very well in the passenger and cargo segments even during economic crisis? Is China Southern Airlines (CZ) that prosperous? Again, neighbouring airports are highlighted in purple, while 3 airports (highlighted in blue along with KUL) recorded a growth. I think KUL's statistics improved quite well up until June 2009 as compared to the same up until May 2009. Hope better things are in store for us. MAHB revised their targetted passengers growth from -5% to up to +4% for this year. AIRPORT operator Malaysia Airports Holdings Bhd (MAHB) says overall passenger growth at its airports is stabilising. MAHB chief financial officer Faizal Mansor told Business Times that the year-on-year growth was attributable to better economic conditions. "The monthly passenger growth now is better than a year ago because that was when the economic downturn had just started," he said on the sidelines of the Frost & Sullivan Growth, Innovation and Leadership Congress 2009 in Kuala Lumpur. In August, MAHB saw overall passenger movement at the 39 domestic airports it operates increase 4.6 per cent to 4.5 million passengers. It expects similar growth for September. During its second quarter results briefing in August, MAHB said it hoped for overall passenger numbers to rise 1.5 per cent to 4 per cent this year. MAHB had come out with two sets of headline key performance indicators in March: one based on flat passenger traffic growth and another based on a 5 per cent contraction in passenger growth. On another matter, Faizal declined to disclose the amount in outstanding airport taxes settled last month by budget carrier AirAsia Bhd. "That is something only the government can address as we do not disclose our agreements with partners such as AirAsia," he said. The budget carrier had withheld about RM110 million in payments to MAHB, claiming that it was being overcharged by the airport operator. MALAYSIA Airport Holdings Bhd (MAHB) expects passenger volume to grow by between three and four per cent by year-end. Its managing director, Tan Sri Bashir Ahmad Abdul Majid, said although it expected either a five per cent drop in passenger volume or a stagnant growth, it was fortunate that there was an increase in tourism volume. "Tourism here is doing well even during the downturn. Last year, we experienced a growth of about five per cent, or around 45 million (passengers) in all our airports. This year we expect to have around 47 million," he told a press conference in Sepang today. Bashir said MAHB was expected to attract two more airlines by year-end. He, however, declined the name the airlines. Earlier, MAHB's five international airports became the first in Asia to receive the Safety Management System (SMS) certification in compliance with the International Civil Aviation Organisation's (ICAO) recommendation and the Department of Civil Aviation''s advice. Bashir said MAHB would implement the system at all its domestic airports even though it was not required by ICAO. The SMS certification indicates conformance with safety requirements and continuous improvement in safety performance including essential features such as policy, strategy and planning, implementation, promotion, documentation, staff training and competency. SINGAPORE, Oct 27 — Airlines are reinstating flights which they had cut in the past year and adding more capacity as the aviation industry’s turnaround strengthens. The number of weekly flights at Changi Airport hit a record 4,830 this week — 8 per cent more than a year ago — and is expected to increase even further with carriers planning more services in the last two months of the year, a Changi Airport Group spokesman told The Straits Times. Airlines driving the growth include Singapore Airlines’ (SIA’s) regional arm SilkAir, as well as low-cost carriers Jetstar Asia, Tiger Airways and AirAsia, which focus on destinations within a five-hour radius. From 420 flights a week a year ago, SilkAir now operates 464, with new flights to several destinations, including Medan, Kathmandu, Penang and Hyderabad. Meanwhile, Jetstar Asia is planning new flights to Macau, Phuket, Haikou and Manila in December. The recovery is being seen globally, although not as strongly as in Changi. British travel company OAG, which tracks flight bookings and trends, reported recently that the world’s airlines have almost 300 million seats available this month, a small increase of just over 1 per cent on October last year. Actual flight numbers are down slightly, by 1 per cent to 2.4 million flights, but that is still a big improvement on earlier this year. The boost in flight numbers and seats comes after a prolonged period of weak demand for air travel, which started in September last year with the meltdown of the global economy. As businesses slashed travel spending and leisure travellers scaled back on holidays and long trips, airlines had to cut not just flights, but also fares, to match supply and demand. Now, airlines are filling more seats. This is a clear sign that airlines have got their numbers right with the flight cuts made so far. Also, demand for travel is starting to pick up. The Association of Asia Pacific Airlines, which represents 17 carriers, including SIA, said yesterday that following consecutive monthly declines for over a year, member carriers carried 10.8 million international passengers last month — the same as the number carried in September last year. Director-general Andrew Herdman said that while profitability remains a challenge, the September traffic figures “offer some encouragement amid signs of a continuing pick-up in consumer confidence and economic activity, led by the Asia-Pacific region”. For travellers though, the recovery is a double-edged sword. While more flights means more choice and higher chances of booking a seat, industry watchers say it is a matter of time before fares start to go up. KUALA LUMPUR, Nov 3 (Bernama) -- Airports and airlines must have greater cooperation to reduce overall operational costs rather than just look at reducing air transport charges, Malaysia Airports Holdings Bhd's managing directer Tan Sri Bashir Ahmad said Tuesday. He said it was not necessarily true that airlines would come to an airport if the aeronautical charges were lower, but carriers would go to places where there were markets for them to benefit. "Heathrow charges are high but airlines still want to fly there. So, government incentives and lower charges do not necessarily bring airlines to airport," he said at a panel discussion entitled "Cash, Capacity, Crisis" at the Airports Council International (ACI) World & Asia-Pacific Conference and Exhibition here. Bashir said there were many things that could be done such as having a shorter turn-off or taxiway and giving airlines good slots. "Discussions are needed on other issues in terms of total costs rather than just airline charges," he said. At the same event, Malaysia Airlines managing director and chief executive officer Tengku Datuk Azmil Zahruddin also called for greater cooperation between airlines and airports. Although he and Bashir have scheduled bi-monthly meetings to discuss how both parties could work together to reduce cost and enhance operation, Tengku Azmil said airport charges was only one of many facets of business the airline was looking at to reduce costs. On the regional airport industry, ACI Asia-Pacific president Max Moore-Wilton said the industry needed to resume its growth trajectory and continued with infrastructure development to further develop the markets. "The development of airports and markets in Asia-Pacific will lead the way for the rest of the world," he said in his keynote address at the opening session of the conference. Moore-Wilton also said that the downturn for the industry may have bottomed out, indicating the possibility of a moderate recovery next year. "Growth may be delayed, but not stopped," he said, adding that airports needed to have a strong commitment to services to be more innovative. At the conference, ACI World chairman Jim Cherry in his keynote address said that airports had lost 10 to 20 per cent revenue globally since the financial crisis started. Cherry said the airports which suffered the most were the ones with weak carriers and capital expenditure underway, adding that airlines could react quickly to financial crisis by adapting its business model to the scenario while airports generally has a fixed business model. "Airports don't have the atitude or flexibility like the airlines do. We are more of a long-term model but we have been doing better following good government support and low debt loads," he said. They only realize now? Better late than never. What are they going to do next? To abolish the satellite terminal? To encourage outstation express bus to pick up pax at MTB? To permit city taxi to pick up pax? To reduce car park charges? To reduce duty free price? To reduce food price in MTB? Until they walk the talk, it is just another talk. I have compiled the data since May until July 2009, and here they are in a much better presentation. I will update the diagram on a monthly basis. KUALA LUMPUR, Dec 28 (Bernama) -- Passenger traffic at the Kuala Lumpur International Airport (KLIA) increased by 16.7 per cent to 2.615 million passengers in October 2009 from 2.240 million passengers in the same month last year. Of the total, 1.766 million were international passengers and 848,656 domestic passengers, Malaysia Airports Holdings Bhd (MAHB) said in a filing to Bursa Malaysia Monday. It said that passenger movements at other airports under its management saw a 14.3 per cent increase to 1.866 million passengers in October 2009 from 1.633 million passengers previously. MAHB said cargo movements at the KLIA went up by 11.1 per cent to 57.533 million kilograms of cargo from 51.763 million kilograms of cargo previously. For the other airports, cargo movements rose by 4.5 per cent to 77.690 million kilograms of cargo from 74.368 million kilograms of cargo previously, it said. The airport operator said aircraft traffic at the KLIA rose by 7.9 per cent to 19,371 planes in October 2009 from 17,960 planes in the same month last year. As for the other airports, aircraft movements rose by 13.9 per cent to 47,260 planes compared with 41,503 planes previously.